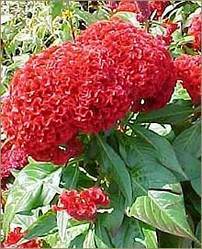 Common Name : Cockscomb, Yellow Toreador, Red Cockscomb, Foxtail Amaranth, Crested Celosia, Fire-flame Bush, Shinaji Tea, Woodfordia. Habitat : Throughout india but abundantly found in north india upto 1600 m.
Uses : The flowers are acrid, astringent, styptic, depurative, utreine sadative, constipating, antibacterial, corrective of urinary pigments, febrifuge and alexeteric. They are useful in the conditions of kapha and pitta, leprosy, burning sensation, skin diseases, diarrhoea, dysentery, fever, headache, hemorrhoids, herpes, internal hemorrhage, leukorrhea, liver disorders, menorrhagia, ulcers, wounds. Juice of leaves is used in bilious sickness. They are also valued as a stimulant in pregnancy. The seed is hypotensive and ophthalmic. It is used in the treatment of bloodshot eyes, blurring of vision, cataracts and hypertension. The flower and seed is astringent, haemostatic, parasiticide and poultice. It is used in the treatment of bloody stool, haemorrhoid bleeding, uterine bleeding, leucorrhoea and diarrhoea.